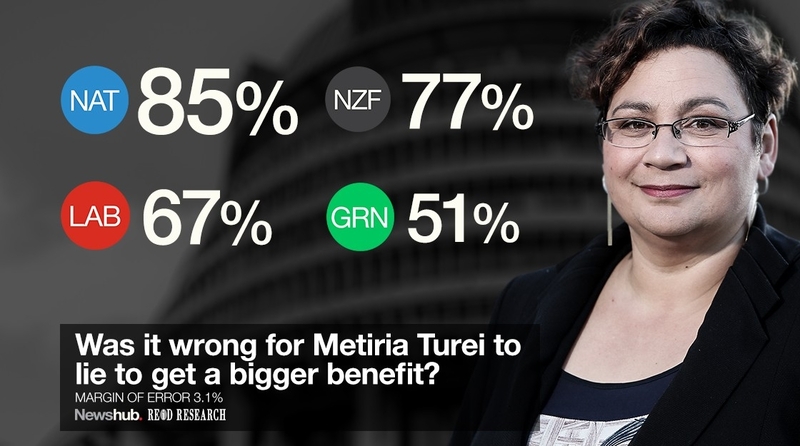 Perhaps I see the glass half empty but I find it appalling that 15% of National Party voters think it is OK to rip off the hardworking taxpayer, and a third of Labour Party voters and half of all Green voters. That is truly shocking and makes me wonder why anyone would be foolish enough to work for a living, just so they can be forced to contribute to these arrogant crooks. I dislike politics and politicians generally but this woman takes the cake. I cannot recall watching anyone prove their stupidity and dishonesty more comprehensively than Turei. She really is thick if stupid is as stupid does. What's the bet she was living with her sperm donor while on the DPB? 2. What address/phone number she had in the white pages in 1993 and 1994? Anyone know the answer to either of those questions?? Materia has said she wouldn't take a ministerial position if elected to gov't, but she will not resign . In other words she wants to continue to receive her big fat salary for doing nothing. She would have to be the highest paid, career, self serving, cunning, beneficiary in the country. Yonder come Miss turei, how in the world did you know? Look on the bright side. Her first announcement moved 5% of labour voters to the Greens, got Little fired, Adern in, and should guarantee a Nat+ACT government.